Interactive Tracking in Berlin’s Spandau District — Attempt Nr. 1! Spandau. Sixteen youths are carefully studying a memorial plaque in a building entryway. Interested young people with iPads in their hands are having an animated discussion on the streets of the old quarter. We’re talking about schoolchildren from the 9th grade at B. Traven Upper School tracing locations of Jewish life. They’re testing our online portal “Topography of Jewish Life in Germany,” which pools information on this subject for the first time and depicts it on an interactive map (our colleague Dana Müller has already reported on it here on the blog). In the portal, the teenagers can also upload their own writing, photographs, and videos of places they discovered. They’re enthusiastically testing more functions, navigating by means of the digital map through the Jewish parts of Spandau’s historic district, clicking on apartments, reading texts, contemplating pictures, and relentlessly asking questions. Orientation is not an issue for them. So they make a lot of discoveries, for instance that the building that today houses a bank used to be a well-known “Jewish department store,” the Sternberg Department Store. They’re actually getting passers-by involved just by sharing their enthusiasm. At the end they ask us, the museum’s educators and project developers, to offer another such workshop again soon. 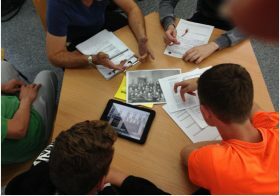 Well — that’s how we would have liked it to go the first time we tried out how to combine the online portal successfully with our mobile museum on.tour — The Jewish Museum Berlin Tours Schools (more about on.tour on our website). In reality not all the young people were particularly enraptured by the idea of serving as guinea pigs for the portal on their precious project days. But they participated anyway! One little group of pupils collected in front of the house at Havel Str. 20. 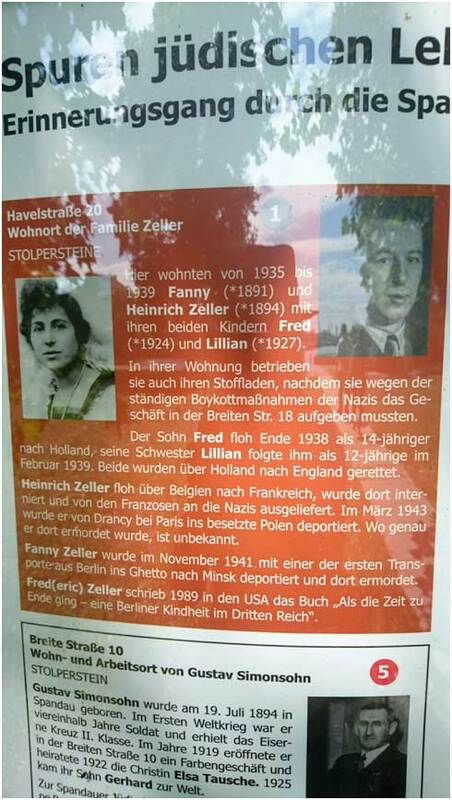 Here lived a boy called Frederic Zeller and his family from 1935 to 1939. 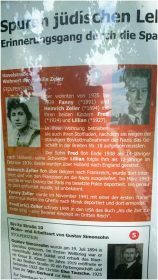 The parents ran a cloth drapery shop from their apartment after they had had to give up their former business at Breiten Str. 18 because of the constant Nazi boycotts. Today their apartment building is a cinema. In reality, the interest in this very direct connection, through local history, to where children once lived could definitely be more lively. But to our delight, some of them did say finally, “The workshop was very interactive and gave us a lot of freedom.” Some said they found “nothing” or only “the breaks” good. 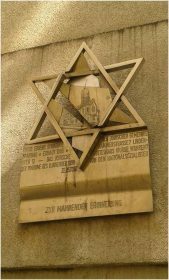 Others actually enjoyed tracking down the former locations of synagogues, businesses and apartments belonging to Jewish families, and so on, that popped up on the portal’s map. And they liked being able to look things up in the texts that we’d brought along. 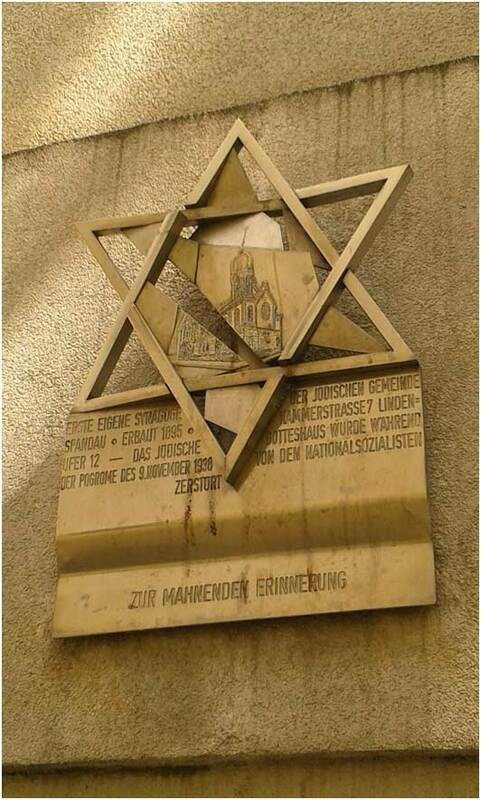 Some were amazed that there had been “so many synagogues” in Spandau or that their favorite pizzeria had once been a Jewish store. They liked discovering “real history” right outside their front door. And as we’d dearly hoped, they “saw Spandau with new eyes” afterward! And us? With an abundance of new didactic, creative, and technical impulses we returned gratefully to the museum. The workshop was still bumpy at points and our prototype stalled occasionally — but that’s why you test it. We know quite a bit now about what we need to improve and will be conducting more usability tests with future users of the portal. The next thing we’re planning is a test workshop with students at the Moses Mendelssohn Center in the middle of May of 2017. Other members of the public — amateur historians, descendants of Jewish exiles, and of course anyone else who’s interested — are warmly invited to join us in participating in this further development phase of the online portal. Please contact us for more information! Then in May of 2018 we’ll be presentable enough to launch our new educational offering. Anika Nowak-Wetterau would like to get more school-kids excited about regional Jewish history and is already looking forward to the next test workshops in 2017. Dr. Barbara Rösch feels that her work has succeeded when the facts and data she’s researched about Jewish history are appreciated today and seen in relation to on-the-ground locations.